It’s safe to say that there are some of us who like to stay away from the hustle-bustle of commercial tourist destinations. So go ahead, channel your inner Robert Frost and say hello to a road less travelled with these offbeat weekend getaways from Delhi. Surrounded by six acres of lush green cardamom forest area, Bon Farm House in Sikkim fits the bill for a quiet getaway in the hills. The food here is cooked with the freshest of ingredients; you even have the option of trying your hand at cooking a few authentic Sikkimese dishes yourself. If you’re looking for some TLC, try Dotho—a Sikkimese hot-stone herbal bath. 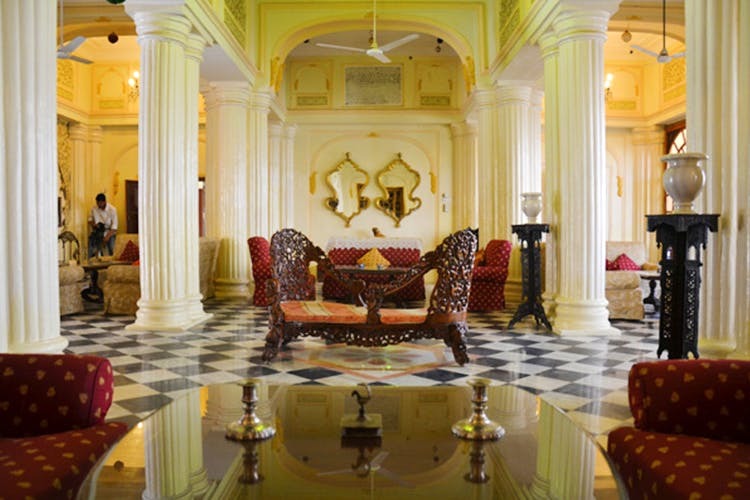 Founded in 1611 AD, Kishangarh is a heritage town located about 72 kms away from Ajmer; this is where you’ll find Phool Mahal Palace which has been converted into a luxury heritage hotel. The location is pretty stellar—right at the brink of Gundalao Lake and with the Kishangarh Fort as its backdrop. The rooms have been done up with antiques and colonial furniture to retain that old-world charm. If you do end up going there, we suggest you check out Studio Kishangarh, which is an art initiative by the princess of Kishangarh to revive the Kishangarh style of painting. With a view of oak, rhododendron, deodar, and pine tree-covered mountains, Bob’s Place is situated at the heart of the Kumaon Himalayas. They have multi-level standalone cottages; you can pick the ones situated higher for a great view and the lower ones for a gorgeous sit-out area. Each cottage comes equipped with a fireplace, heater, and blankets, so you can be nice and toasty. Head out on one of the many walking trails and come back to gorge on some yummy home-cooked food. Located in Garhwhal about five kilometres from Chamba, Saur was a once a forgotten village that had been abandoned by its inhabitants, until it got picked up by DueNorth—a group that promotes tourism adventure in Uttarakhand—for restoration. The cottages are Pahari houses that have been renovated to accommodate guests and are essentially made of bamboo, mud, stone, and wood. Look out for the handicraft items made by women from the village. We also suggest you don’t leave without trying some locally-made rhododendron juice. Located in the picturesque valley of Palampur, Norwood Green is where you should head to get a breathtaking view of the Bundla tea gardens. Their boutique cottages are warm and inviting, and perfect to spend a few idyllic days. You even have the option of renting bicycles to go on a tour around the valley.